In prostate brachytherapy, intraoperative dosimetry would allow for evaluation of the implant quality while the patient is still in treatment position. Such a mechanism, however, requires 3-D visualization of the deposited seeds relative to the prostate. It follows that accurate and robust seed segmentation is of critical importance in achieving intraoperative dosimetry. Implanted iodine brachytherapy seeds are segmented via a region-based implicit active contour model. Overlapping seed groups are then resolved using a template-based declustering technique. Ground truth seed coordinates were obtained through manual segmentation. 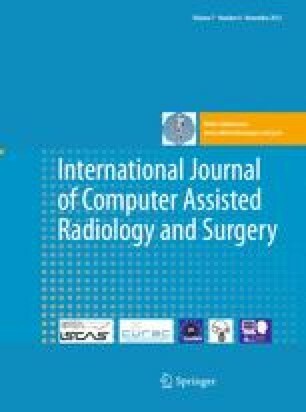 A total of 57 clinical C-arm images from 10 patients were used to validate the proposed algorithm. This resulted in two failed images and a 96.0% automatic detection rate with a corresponding 2.2% false-positive rate in the remaining 55 images. The mean centroid error between the manual and automatic segmentations was 1.2 pixels. Robust and accurate iodine seed segmentation can be achieved through the proposed segmentation workflow. E. Moult was supported by the NSERC USRA program. G. Fichtinger was supported as a Cancer Care Ontario Research Chair.